Once again, the BLM is attempting to slip in under the radar a Environmental Assessment aimed at conducting inhumane, Frankenstein-like, spaying experiments on America’s wild horse mares. And to complicate matters public responses must be in the BLM’s hands by Monday the 4th…great. PLEASE promptly relay your indignant objections to this most barbaric experimentation on our federally protected Wild Horses. No ethical vet would do this. It will kill a lot of the mares and their bodies will be unaccounted for. Mares that are in foal will probably abort their foals also. This is nothing but cruelty. We can save ourselves a lot of money by simply pointing out that mares will still need to eat, drink, socialize and migrate the same amount whether they are sterilized or not. Expected differences include: not coming into heat, not contributing to genetic viability, mortality, perhaps social infighting as they try to steal other mares foals, and of course: not gestating or creating milk for nursing foals. The only environmental impacts of note may well be disposal of their amputated organs, and their carcasses when they die from this pointless and painful procedure. Every member of Congress should have Grandma’s Gregg’s 120 page report. How many wild mares have died from BLM’s sterilization experiments? Sept. 2009 – 41 mares were spayed, complication rate 2.7%,. Pielstick claimed there were no deaths, but the mares were only observed in corrals for 24-48 hours before being released back into the wild. (this skewed the data and left no reliable information regarding post surgical complications and deaths). In July 2010 (11 months later) the BLM incidentally spotted about half of the spayed wild mares during a pronghorn survey). But what happened to the other half? What you’ll see in the documents at the bottom of this article seem to indicate that there has been experimentation without properly planned protocols (which should’ve included having medication at the site in case of an adverse reaction to any drugs) and with haphazard (if any at all) monitoring after the procedures. It seems as if the BLM is fishing for “inferences” to push these FWS experiments as a “tool in their toolbox” for population control of wild horses. BLM should be doing ON THE RANGE MANAGEMENT OF VIABLE HERDS. Most herds are NOT viable. Stay on this point: Should BLM even be doing population control/fertility control on NON-VIABLE HERDS? Colorado Springs, CO – On May 10, The Cloud Foundation (TCF) received a call from an unnamed Phoenix resident who had witnessed deadly burro and mare sterilization operations performed in Arizona last month by Dr. Leon Pielstick, DVM, the veterinarian slated to perform such procedures on hundreds of wild mares and foals, currently being held in the Bureau of Land Management (BLM), Hines, Oregon corrals. 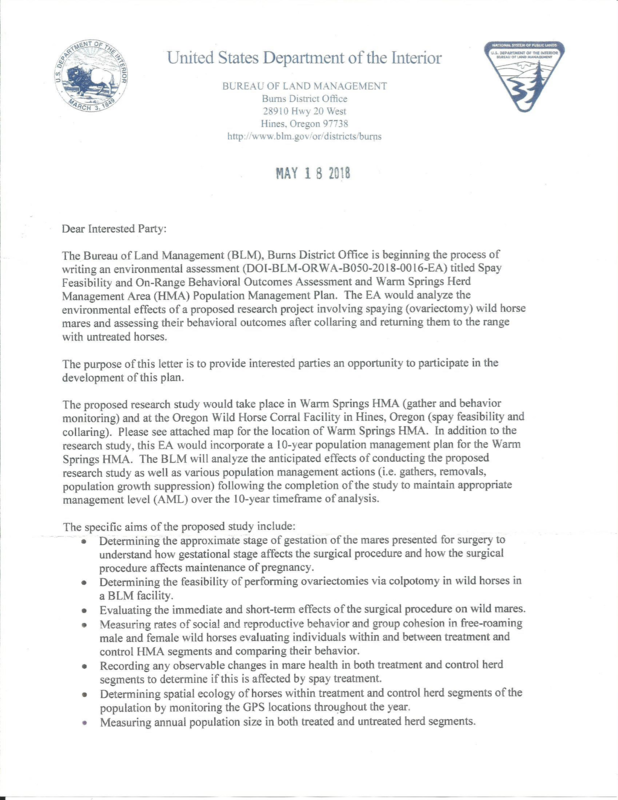 The BLM funded mare sterilization operations would be undertaken through a BLM grant to Oregon State University (OSU). The ovariectomy surgeries on the handful of female burros and one mare resulted in one of the burros bleeding out (evisceration) and the mare dying two days later. To date TCF has been unable to find out whether the other burros are alive. They were believed to have suffered serious infection. In an ongoing effort to halt BLM-funded, inhumane sterilization research on wild mares (procedures rarely used on domestic mares that can be easily handled and given necessary after care), the Cloud Foundation, other humane organizations, and thousands of Americans have been in communication with OSU, urging them to abandon the research project. BLM is a bunch of crooks with crooked ranchers. Stand up AMERICA now. Leave them alone. No more animal experiments. ENOUGH! If Oregon’s Senators cannot be contacted by e-mail, then Twitter works well. @SenJeffMerkley @RonWyden The BLM oversight committee should also be contacted by Tweet storm. Does this mean BEFORE Monday, or up until midnight (or end of work hours — what time zone) Monday? It would help to have clearer timelines, especially when they are this disturbingly short. I can’t believe anyone would approve of this procedure, it is cruel and inhuman. This should be outlawed. No one that cared or is responsible for the care of animals should consider this approach to birth control. Barbaric treatment of United States wild horses will not be tolerated by our citizens. These animals are loved and adored by everyone. Do they think its the same as spaying a dog or cat? Its not you idiots. More like torture. What is wrong with these folks. They’ve bumped their Damn heads. Agreed. They need to be left alone. Leave them alone! Wild horses need to stay wild. Don’t slaughter or experiment on them. ENOUGH. MUST WE HURT & DESTROY EVERY BEING? STOP.